Can Small AUVs Work at Sea? This post published on NavalDrones.com and was republished with permission. It may read in its original form here. 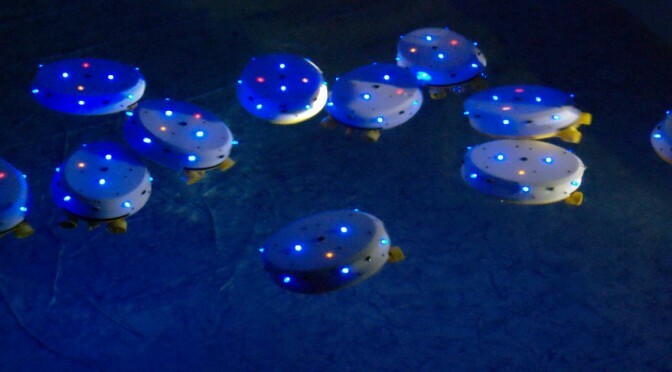 The researchers at CoCoRo continue to push the limits of autonomy and swarming behavior with autonomous underwater vehicles (AUVs). Recently, they’ve taken their AUVs out of the controlled laboratory tanks and into the wild, with small scale tests in ponds, lakes, and protected ocean harbors. These robots are prototypes designed to explore small scale autonomous group behavior. But the ocean tests hint at possibilities of using smaller marine robots to perform useful functions. Unmanned Underwater Vehicles employed in military and research operations range in size from man portable, weighing less than 100 pounds, to monsters such as Boeing’s Echo Ranger, which weighs more than 5,000 kilograms. Small scale AUVs weighing less than a few kilograms or so are limited in endurance primarily due to battery size. More importantly, the ocean environment presents a number of challenges for tinier AUVs including surf and currents, poor visibility, and even hungry marine predators. But CoCoRo’s tests of their “Lily” and “Jeff” robots are early indications that these types of AUVs can operate on a limited scale in ocean conditions. What say you, readers? Can small AUV’s do real work in a maritime environment? If so, what are some potential applications for mini-AUVs? Can the obstacles the ocean presents to AUVs be overcome with larger numbers of vehicles or swarming behavior?